On August 29, 1870 the Jewish citizens of Canton assembled at the residence of Mr. J. Loeb for the purpose of forming a congregation. They elected the following officers: C.L. Gross, President; Jacob Stadeker, Vice-President; D.I. Zon, Secretary; Samuel Loeb, Treasurer; M. Hoel, Joseph Wolf, and Jacob Loeb, Trustees. Like many Jewish communities, Canton Jews elected to procure a cemetery first. This cemetery bears evidence of Jewish life in Canton before Temple B’nai Israel was built, and displays graves showing birthplaces from all over Europe including Rehinbellen, Germany; Krotochin, Prussia; and Seibersbauh, Pheinprussien. Before his death in 1974, Isidore Perlinsky deeded the Jewish Cemetery to the City of Canton, exchanging a $4,000 payment for permanent care of the cemetery. Kind friends and dear Brethren, the late war, the most cruel battle between the North and South, has made poor people out of us, and we will have to remember it for years to come. Yes, we are poor, none of us, however, suffers for meat or bread, but it is entirely impossible for us to contribute sufficient funds for the accomplishment of our undertaking. Help us, assist us, as we always assisted you whenever called upon. We have sent contributions north, south, east and west, wherever it was, for the erection of a ‘House of Worship,’ and now your aid and assistance for our undertaking is most respectfully solicited, and will be duly appreciated by this congregation, which the undersigned have the honor to represent. When finished it will be an ornament to our town, and will reflect credit upon its projectors while it will stand as a monument of Jewish devotion to religious traditions, a temple to the honor and glory of Israel's God. In 1877, B’nai Israel’s simple frame building was built, but due to an epidemic of yellow fever, it was not dedicated until 1879. Though the congregation was originally Orthodox, they soon adopted elements of Reform Judaism. In May of 1878, Congregation B’nai Israel published a help wanted ad in The American Israelite for a minister and teacher. They solicited an individual with “competency to lecture in the English language, conduct divine service according to Minhag America, and to teach the English and German languages in all their branches.” The initial congregation was about 25 member families. Rabbi Hecht served as the Temple’s first teacher, and Julius Loeb served as the first President. Rabbi Jacob Safa followed Hecht. 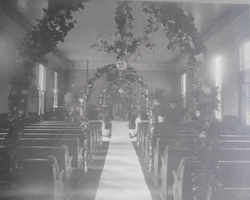 For much of the early 20th century, Mr. Maax Lewinthal served as a lay reader for the congregation. Frequently called Rabbi, he studied for the rabbinate and was a learned Hebrew teacher and religious scholar. During the 20th century, the community did not grow, and went into prolonged decline. In 1907, B’nai Israel had 20 member families. By 1959, they only had only 10 families. Canton’s Jewish population continued to dwindle as many of the Jewish children chose not to follow in the store-owning footsteps of their parents. Improved roads linked Canton with the capital city of Jackson only 20 miles to the south, so the remnants of the Canton Jewish community became enfolded within Jackson’s growing Jewish community. Finally, in 1974 B’nai Israel was purchased and torn down by Lee Breland. 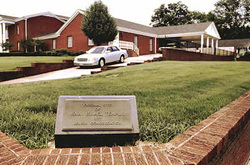 A funeral home stands at the former site, which is commemorated by a historical marker. Though the temple no longer stands, the Canton Torah is now housed in Jackson. “Canton’s Once-Large Jewish Community is disappearing,” Madison County Herald. June 29, 1978. “B’nai Israel Synagogue has stood since 1877.” Madison County Herald. Nov. 8, 1973. Wechsler, Judah. “A Trip Down South.” The American Israelite. Sept. 6, 1871. Zon, David I. “Correspondence.” The American Israelite. Sept. 9, 1870.